Welcome to northern Iceland, where the sheep are brawny and the men are taciturn. Estranged brothers Gummi and Kiddi are particularly quiet. They haven’t spoken to each other once over the last forty years. 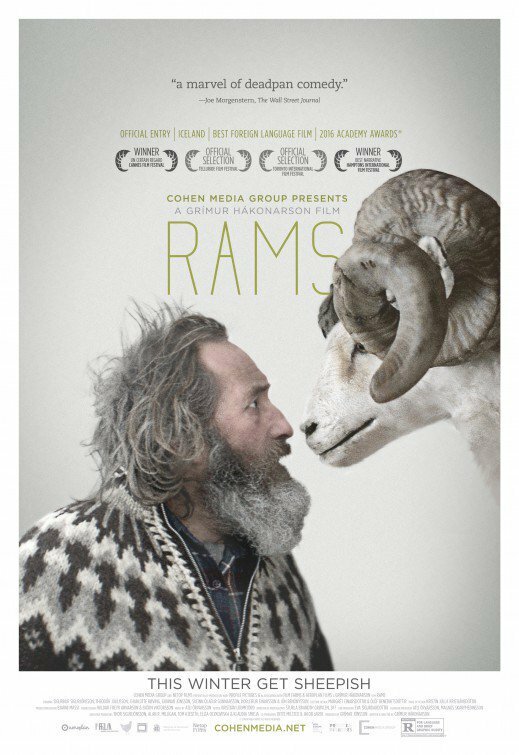 That happens in farm country, but disaster is about to strike their peaceful valley in Grímur Hákonarson’s Rams (trailer here), which opens this Wednesday in New York at Film Forum, following its screenings at the 2016 Sundance Film Festival. We never really know why they had their falling out, but we eventual have reason to suspect the younger, more sensitive Gummi was the favored brother. They live nearly side-by-side, tending flocks descended from the same legendary stock, but their feud remains unabated. The only communication is conducted through terse notes carried by a neutral sheepdog. Kiddi has just edged out Gummi in the annual best ram contest by a fraction of an inch, but when the sulking loser takes a look at the winning ram, he thinks he sees signs of the dreaded scrapie (BSE). A fatal viral disease related to Mad Cow, scrapie is no laughing matter. Due to the close proximity of their sheep, a finding of scrapie at Kiddi’s farm is likely to be just as devastating for Gummi. Of course, he is sure his brother will not see it that way, so he cautiously approaches a third party instead. Unfortunately, Gummi’s diagnosis proves to be painfully accurate. Naturally, this does not exactly thaw the brothers’ cold war. Kiddi lashes out and then seeks refuge in drink, but sad-eyed Gummi has a desperate plan up his sleeve. Rams bears many superficial resemblances to Benedikt Erlingsson’s drily comic Of Horses and Men, but it is a darker, more Spartan film. Real livelihoods are at stake in Rams, but the bond between men and sheep is even more tragically significant. For the brothers and their neighbors (for Gummi, they are also friends), scrapie is like Armageddon. Frankly, the endlessly expressive and empathic Sigurður Sugurjónsson’s Gummi also gets the better of Theoódór Júlíusson’s more sitcom-ish Kiddi. There is a reason why he is the primary POV character. You can tell a lot about the younger brother just by the way Sugurjónsson buckles his overalls. Both the windswept Icelandic vistas and the rough-hewn décor of their homes vividly emphasizes the brothers’ isolation. Cinematographer Sturla Brandth Grøvlen gives it all an appropriately Nordic look, while production designers Barni Massi and Sigurb Jörnsson fashion a Fargo-like look for their world, but more austere. It is an extraordinarily refined work of cinema craftsmanship, but the one sheet suggestions a considerably more light-hearted experience than Hákonarson has in-store for viewers. Recommended for fans of low-key Scandinavian fare, such as the films of Bent Hamer, Rams opens this Wednesday (2/3) in New York, with fresh credentials as a Spotlight selection at this year’s Sundance Film Festival.